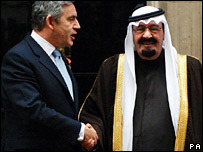 Gordon Brown's talks with King Abdullah of Saudi Arabia were very positive, British officials have said. They say there was a "meeting of minds" in the discussions which included the Middle East peace process and a planned US-sponsored peace conference. Officials said human rights were not raised at the meeting between the prime minister and the king at Number 10. Protests have taken place over Saudi Arabia's human rights record and arms deals during the king's state visit. Mr Brown and King Abdullah discussed their expectations for the peace conference in Maryland but the monarch did not give a clear indication whether his country would be represented. The prime minister emphasised the importance the UK attaches to Saudi leadership in the Middle East. They both agreed that a viable Palestinian state was key to a solution in the region. Counter-terrorism was discussed and the prime minister thanked the king for Saudi efforts on the issue. However, there did not appear to be any specific discussion of the king's claim in a BBC interview earlier this week that the UK had not tackled terrorism with sufficient seriousness. King Abdullah had also said the UK failed to act on intelligence passed by the Saudis ahead of the 7 July suicide bombings in London - a claim denied by the Foreign Office. Education was high on the agenda, including its use as a tool to counter radicalisation in Saudi Arabia. Officials said human rights in Saudi Arabia have been raised at other meetings during the king's time in the UK. Protests, which are set to continue, have included a boycott of the king's visit by acting Liberal Democrat leader Vince Cable. Demonstrators also lined the route near Horse Guards Parade when King Abdullah received a ceremonial welcome from the Queen on Tuesday. Saudi Arabia is a major trade partner with the UK - a relationship that came under scrutiny when the British government stopped a Serious Fraud Office corruption inquiry into the Al-Yamamah arms deal with BAE Systems. In a speech at a state banquet hosted by the Queen, the king spoke of the "ominous signs of war and conflict in the world". The Queen, in her banquet speech, said the UK and Saudi Arabia must work together against terrorists "who threaten the way of life of our citizens". The last visit by a Saudi king to the UK was 20 years ago.